Szikora is ever ready with new titles for her artwork and making them puns and ‘Sweet Music’ in no exception, describing the beautiful sounds the little gingerbread are singing and also what a regular ginger biscuit must taste like! 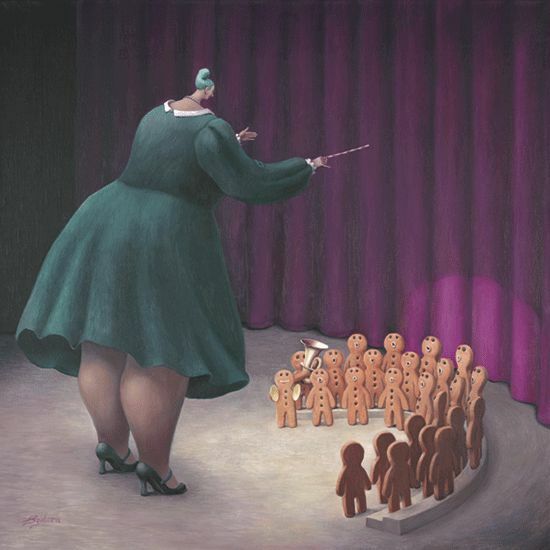 An adorable limited edition artwork and Sarah manages to make the little gingerbread even cuter, by emphasizing the size difference between the choir (or is it a band?) and the overweight conductor. Notice the lush purple velvet curtain and the grey toned cool floor they all stand on and the theatrical aspect makes me think of the Muppet Show - they will burst out into song and dance any minute!